Denver, CO, May 24, 2017 – The White House yesterday released its full fiscal year 2018 budget request, which proposes to eliminate funding for programs that further Habitat for Humanity’s efforts to address the affordable housing crisis in metro Denver, and across the United States. 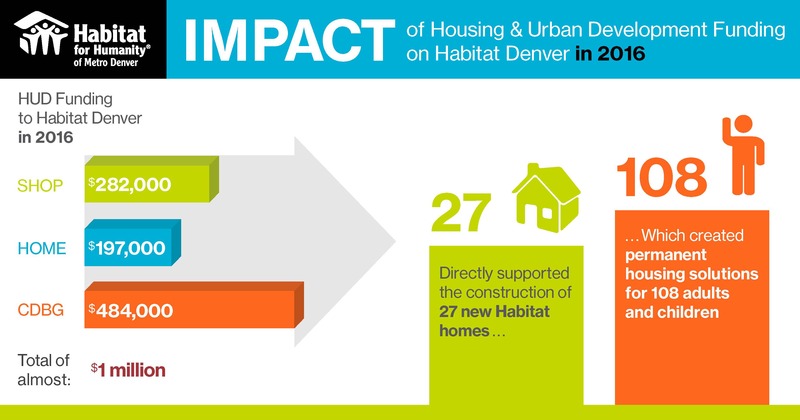 Habitat for Humanity of Metro Denver encourages its supporters and all advocates for affordable housing to contact their members of Congress and urge them to support adequate funding for these critical programs in the fiscal year 2018 budget. Without the proven programs that are now sadly in jeopardy, too many of our neighbors and fellow citizens will be denied access to the tools they need, to a hand up that helps them build better lives. These tangible, practical and fruitful investments play an important role in furthering the reach of Habitat’s work, and we call upon our elected officials to not lose sight of the effectiveness and significance of these programs in communities large and small as they consider this White House budget request.